When new archetypes and tribes have been added to Hearthstone in expansions, they don't always take off straight away. Take Dragons, for example. When they were first released they were good, but it wasn't until Twilight Guardian came along in The Grand Tournament that Dragon Priest became a top tier deck. Maybe Elemental Shaman could follow the same path, with a new card being added in the next expansion. 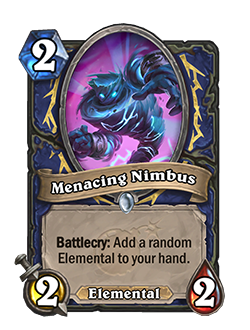 Menacing Nimbus is the latest card to be revealed from The Boomsday Project, the next expansion arriving in Hearthstone. It's a two mana 2/2 Elemental, and when it's played it adds a random Elemental to your hand. It fills a similar sort of spot to something like Raven Familiar. The 2/2 body is fine to play on curve, but it fills a more important purpose. For Elemental decks being able to chain together a series of Elementals is crucial. There are a number of cards, like Kalimos, that will not trigger their powerful effects if they don't come down the turn after another Elemental. The Boomsday Project is currently available to pre-order, and releases Aug. 7.